Before I begin, I must add a great big HAPPY RELEASE DAY!! !- to The fabulous Linda Gerber, author of the book reviewed here. So everyone be sure to check out her blog for all sorts of release day news (*whisper* and book give-aways). So with no further gilding the lily or further ado... I give you the Maelstrom review of Death By Bikini. Aphra Behn is your not-so-average teen girl. She lives with her father on a tropical island resort in the middle of nowhere and serves prolific celebrities every day. Everything is on the hush-hush on the island, from new and famous romances to messy breakups. But the arrival of the Smith family is oddest. They don't appear to be registered and have been placed in a villa still under construction. All is not well in paradise. To make matters worse, a visitor has just been discovered on the beach, bikini strings fastened too tight around her neck and stone... cold... dead. Aphra's father may blame the macabre event on the unpredictable surf, but our heroine knows better. And she'll go to great lengths to find out the why of the Smiths, the who of the killer, and the mysterious identity behind the mother she thought was lost. This novel was a great beach read. The characters were almost as intense as the plot and they all had secrets. From the very beginning, I was as determined as Aphra to figure them out. Aphra was an excellent character, with completely real emotions and a fantastic deductive mind. I don't think I predicted one plot twist through the entire thing and was surprised at every turn. It made my plane ride go by so quickly I could barely comprehend that it was over as we landed. Ms. Gerber's humor is quick and every so often the person sitting next to me would look over with a mask of concern at my outbursts of laughter. My only major complaint on this entire read is that it ended so abruptly and I can not imagine how I will survive the wait until the release of its sequel, Death By Latte (September 4th!). So what are you waiting for? 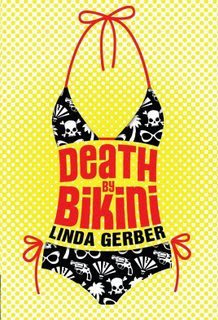 Death By Bikini comes out today! Gogogo! Get a copy! 6.7 for this escape of a suspense novel! KWASHAAA!! zap. I've been hearing a lot of good things about this book. I'm looking forward to reading it.